Twenty three members of security forces have been killed by the PKK since 7 July, Anadolu Agency reported, and I’m sure this number will have increased by the time this column is published. 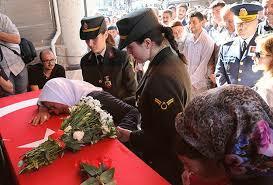 Same goes for civilians who have lost their lives at the hands of the state, most recently three people in Silopi. And how many PKK fighters died? The army says some 390, KCK co-leader Bese Hozat, with whom I had an interview last week in Qandil, said that was just state propaganda, claiming nine of their guerrillas died. Hard to tell who’s right, but 390 seems an exaggeration when you consider the experience the PKK has in keeping themselves safe up there in the mountains for decades already. 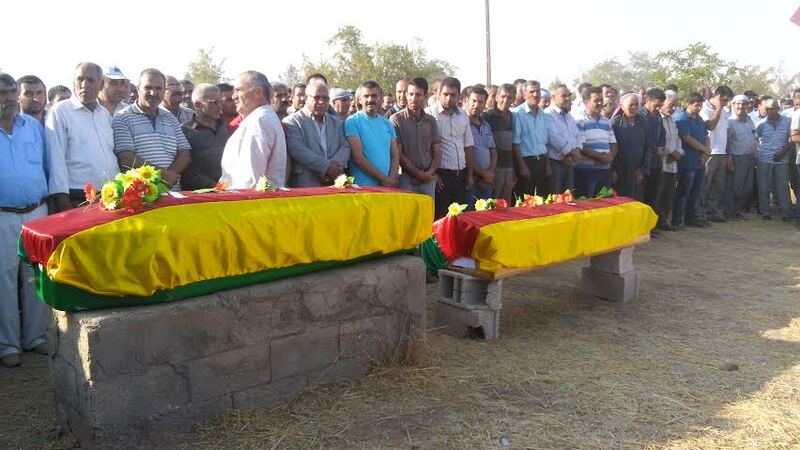 Coffins with Kurdish flags. These two young men were victims of Suruc massacre, 20 July 2015. Photo: Fréderike Geerdink. However high the numbers, the fact is that the violence is totally spiralling out of control and every day there are new families and new communities mourning the loss of a loved one. The grief over coffins is heartbreaking to see, whether the coffin is buried with a Turkish flag or with the Kurdish colours. I can only wholeheartedly join the call from HDP and CHP politicians and from academics and intellectuals to both sides to return to the negotiating table. Not that I have much faith that this will happen any time soon. While many in Turkey try to urge both sides to stop the violence, for Bese Hozat that didn’t seem to be an option anymore. I asked her if local PKK cells in Turkey were actually fully under their control, and whether they would listen if the KCK leadership told them to stop the violence. 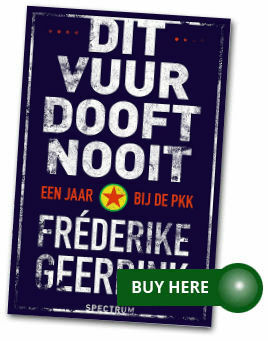 The PKK and the state are at war again, and the PKK isn’t the only one claiming to act only in self defence. A circle hard if not impossible to break. But, as I heard several people say, with this it seems that the government and the PKK have a common goal as well: drag the HDP under the 10% threshold in the (very likely upcoming) early elections. I’m convinced that is the goal of the AKP and of President Erdogan, but I object to the suggestion that the PKK wants the same and that this is also, in other words, some kind of power game between the PKK and the HDP. It is not a power game between two important representatives of the Kurdish political movement. It is what it has been for a century: the state trying to crush the Kurds, whether they hold arms or try to get their rights through non violent means. Both the PKK and the HDP are after the same thing: self determination for the Kurds within a democratic Turkey. The PKK doesn’t want the HDP under the 10% threshold, the PKK wants the threshold abolished. Funderal of gendarme Mehmet Kocak, 26 July 2015. If there are new elections and if the current violence brings the HDP under the 10% threshold, the only entity happy about it will be the AKP and President Erdogan. The PKK won’t be happy, and, obviously, nor will the HDP. But for the Kurdish movement, both PKK and HDP, it will not be the end of the world either, just as it wouldn’t have been a disaster if they hadn’t done so tremendously well in the June elections. They are a political party, but they are also part of this huge mass movement that the Kurdish political movement has become. If they are not represented in parliament, they will find other ways to get their rights, as they already do in the Southeast with the Democratic Regions Party. They will step up their civil disobedience campaign, they will press for their rights in any non-violent way they can. Whether the HDP will be pushed under the threshold again or not, will be merely a reflection of the state Turkey is in. In June six million people believed in the peace message of the HDP, they believed Demirtas when he said he wanted democracy for everybody in Turkey. If in the next election millions turn their back again on the HDP, it means that people are still easily deceived by the state’s and government’s narrative of ‘terrorists’ wanting to ‘divide’ Turkey and plunge the country into war. But if they do again make it to more than 10%, that will say something about Turkey too: that even in times of violence, people see through the lies and insincerity of the government and through the historical lies about the Kurds being terrorists and separatists. That would give me hope for the future. I need it, because for now, hope is hard to find. Previous Previous post: No, Turkey isn’t returning to the 1990s. It never even got there.